D.I.Y. Mustang Shirt | Oh Sarah O ! Several weeks ago The Boy was getting ready to graduate from Air Force boot camp and I was stressing about what to wear. I knew that I wanted to look cute and stand out in the crowd so that The Boy could easily spot me in the crowd at graduation. After doing some online homework I learned that the boy was going to be dressed in tan for the Airman's Run and I knew that his Recruit Training Squadron (TRS) mascot was the mustang, and after seeing this sweet hand stamped D.I.Y. Pony Print Dress on Elsie and Emma's blog, A Beautiful Mess, I knew what I wanted to do. I found a cheap tan/khaki men's large t-shirt. Mine was on sale at Target. I happened to have a Speedball Speedy Carve Stamp Kit laying around the house (if you don't have a stamp kit, you could always make your own stencil with Freezer Paper, or make a stamp with foam craft paper, cardboard or Styrofoam. 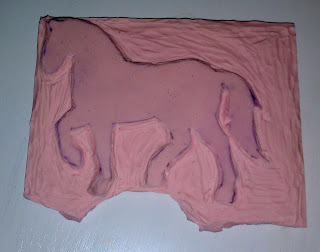 To make my stamp I found an image of a mustang that I liked, traced the image onto my rubber stamp pad and carved around the outline. I watched this YouTube video by ilyjessicaomg and I cut a shark bite shape out of the front of my shirt and did the inverse of that to the back. Then I cut off the original t-shirt collar, rolled my sleeves and applied my stamp using a paint brush and black fabric paint. The stamp worked best when I applied the paint generously. I was able to touch up any patchy spots with a small paintbrush after the stamps were dry. And here is my D.I.Y. mustang shirt in action. I'm super happy with the result and I totally stood out of the crowd.